Google updated the Android distribution numbers today for the month of July, showing Marshmallow jumping up to 13.3% of the share. That’s up from the 10.1% of last month and continues to show the slow, but steady climb of the latest version of stable Android. Of course, we’d all like to see that at 95% by now, especially with Android Nougat all but a month away from a stable release, but that’s not how Android works. If you still don’t get that, dear Apple journos, good luck to you in life. 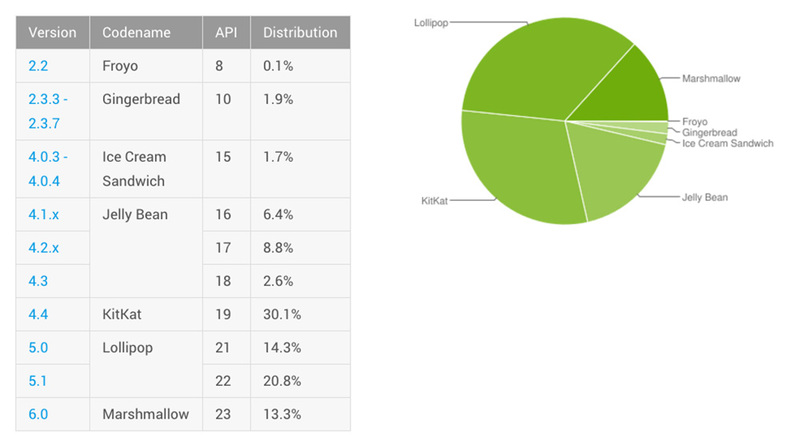 As for the rest of the numbers, Lollipop now sits at 35.1%, KitKat at 30.1%, Jelly Bean at 17.8%, Ice Cream Sandwich at 1.7%, Gingerbread at 1.9%, and Froyo still at 0.1%. Those numbers are all down from June. Last month’s numbers can be seen here.